The next launch of the U.S. Air Force's X-37B space plane, a robotic spacecraft used to fly classified payloads into Earth orbit, has been delayed until next month pending final approvals, SPACE.com has learned. The secretive X-37B space plane, an Orbital Test Vehicle that resembles a miniature space shuttle, is now expected to be boosted in early December by a United Launch Alliance Atlas 5 rocket from Launch Complex 41 at Florida’s Cape Canaveral Air Force Station. It marks the latest in a series of delays for the unmanned space plane. The mission, called OTV-3, had been pushed back from Oct. 25 to Nov. 13, and then to Nov. 27. While no specific cause of the X-37B launch delay was given, previous holdups were called due to the ongoing investigation into an engine glitch that occurred during an Oct. 5 flight of a Delta 4 booster, a relative to the Atlas 5. That launcher experienced below-normal pressure in the upper-stage engine chamber while placing a Global Positioning System 2F-3 satellite into orbit. Holding off on the liftoff of the Atlas 5 rocket has allowed for additional investigation into flight data anomalies in the Delta 4 engine glitch as well as for a thorough "crossover assessment" for the X-37B OTV launch vehicle, officials have stated. Gen. William Shelton, the Air Force Space commander, asked for a discretionary accident investigation board to investigate why the Delta 4 RL-10B-2 upper-stage engine did not perform as expected. As its standard process, the Air Force reviews all flight data to determine whether it's ready to proceed with the next liftoff. According to the online journal of the Air Force Association, Airforce-magazine.com, Shelton commented on the glitch during an AFA breakfast program in Arlington, Va., on Nov. 7. "We have to find out what happened," he said. Shelton commented that the RL-10 had behaved anomalously, requiring "a bit of a diving save" to accomplish the October GPS satellite launch. Looks into why the engine underperformed have not revealed a root cause of the anomaly, Shelton said. ULA's Rye said in a Nov. 2 statement: "This flight data anomaly investigation is being conducted with investigative processes that have been refined over decades of launch experience and include extensive reconstruction of the flight data with analytical models, as well as detailed inspections of several engines." When the Air Force robotic space plane — carrying a classified payload — heads for Earth orbit, it will be the third launch for the X-37B program, and will mark the first re-flight of one of the space planes built by Boeing Government Space Systems. This same vehicle being readied for flight flew the first flight of the X-37B program back in 2010, or OTV-1. That maiden voyage lasted 225 days in orbit and eventually zoomed on autopilot over the Pacific Ocean and glided down onto a specially prepared runway at Vandenberg Air Force Base in California. The OTV-2 mission, using a different space plane model, made a Vandenberg touchdown on June 16 of this year after remaining in orbit for 469 days, more than doubling its sister ship's stay. 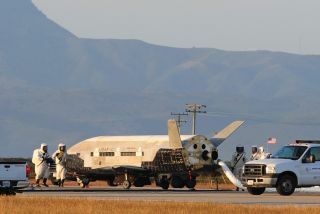 The X-37B craft is 29 feet long (8.8 meters) and 15 feet wide (4.5 m), with a payload bay about the size of a pickup truck bed. Flights of the X-37B are conducted under the auspices of the Air Force’s Rapid Capabilities Office. According to an Air Force fact sheet, the Rapid Capabilities Office is working on the X-37B Orbital Test Vehicle "to demonstrate a reliable, reusable, unmanned space test platform for the United States Air Force." While the prototype X-37B space plane’s mission remains a mystery, the Union of Concerned Scientists, headquartered in Cambridge, Mass., views the program as a less-than-cost-effective way to conduct space activities. In a statement today, UCS space experts said the plane could carry out a range of missions but that in each case there is a better, more efficient and more cost-effective way of accomplishing it. "And because it is an Air Force project and its details are classified, the plane has generated confusion, speculation and, in some cases, concern about its actual purpose," they added. According to the UCS, "what distinguishes the space plane from other spacecraft is its ability to return from orbit and land on a runway. This capability requires extra structure, such as wings, landing gear and heat shielding to withstand the rigors of re-entry, making it significantly heavier than comparable spacecraft that are not designed to return to Earth. Because of this extra mass, the space plane is more difficult to maneuver in space and significantly more expensive to launch." In a briefing paper, the UCS points out that other spacecraft can carry payloads into orbit, maneuver in space and rendezvous with satellites, deploy payloads, and return to Earth for tens of millions of dollars less than the space plane. "The ability to return to Earth carries a high price," said Laura Grego, a senior scientist with UCS’s Global Security Program. "Most space missions don’t require bringing a spacecraft back to Earth, and the space plane makes no sense for them. And if returning to Earth does make sense, spacecraft usually use parachutes, not wings and landing gear. Compared with those, the space plane will have a harder time carrying payloads into orbit, maneuvering in space, rendezvousing with satellites, and releasing multiple payloads." Given Air Force silence in detailing the space plane's raison d'être, other countries may infer that the X-37B has a specialized military purpose. But, according to Grego, the space plane does not make sense as a space weapon or as a vehicle for deploying space weapons. "In a time of tightening budgets, the administration and Congress should take a close look at the X-37B program and figure out why they’re spending money on a program that has no persuasive rationale," Grego said.